The world may not know of it, but the Russians are avid users of social networking sites. They have their own set of social networks that they use to connect with each other and the world with them. And Badoo, Russia’s very own dating social networking site is the most popular with Russians looking for love. All those millions of users who found love using Badoo have Anrey Andreev, the founder to thank.Andreev, yet another young entrepreneur who made millions by forming a social networking site also happens to be the founder of other Russian sites like Spylog, Begun and Mamba. Spylog is a website that helps track the visitors and their habits. Begun is yet another brain child of Andrey would tell us what keywords were popularly searched among the search engines before Google Adwords took form. Mamba is another popular Russian dating site just like Badoo. For a man from Russia (a country relatively less exposed to the internet) who studied management, that sure was a large number of social networking sites to form.Andrey was born in Moscow, was brought up in Spain and Russia. Later, he relocated to London all by himself in the year 1995. He didn’t really finish the graduation that he started off before he dropped out and started Badoo, the dating site that Russians till today from the time that it was formed in 2006. When Andrey formed Badoo, he imagined it to be something of a “telephone bar” where people get to meet new people and make friends with them. However, ask a Russian and they’d call it a hook-up site.Whatever the purpose was, Badoo grew in popularity tremendously since it was invented. As per the statistics, 12 percent of people who used Badoo found the love of their lives, 2 percent got married. Spylog, Begun and Mamba, although lesser popular than Badoo, were in fact formed much before Badoo was. Spylog and Begun were highly complicated softwares that were equivalent to Google Adwords and Google Analytics which were subsequently bought away by other bigger companies. Mamba on the other hand, is yet another dating site that was formed before Badoo, which for some reason did not get as popular as Badoo.For someone who has made so much money and put in so much efforts into connecting people, Andrey, the shy, 39 year old is mysteriously media-shy. He neither makes an effort to advertise his work nor believes in coming out and talking about himself. 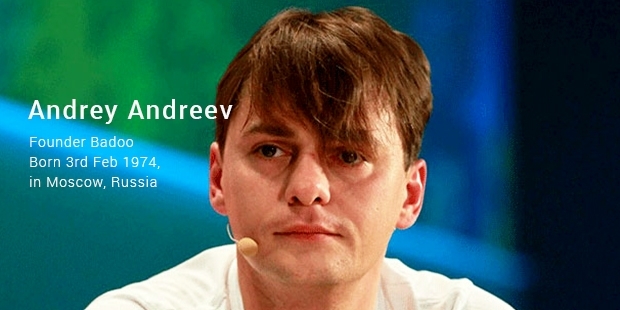 When asked about it he often says that he “loves focusing on making things rather than focusing on himself and his achievements.” Now, that is probably the very quality of Andrey that led to his phenomenal success.